When you're dealing with a chronic disease, receiving new medical equipment that will make your life easier feels a bit like Christmas. 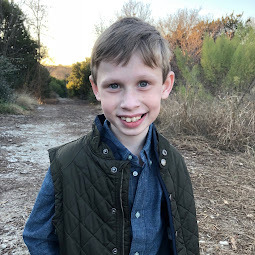 There are two new relatively items on the market that Bennett was able to be approved to access through insurance that we believe will improve the amount of time we spend on treating cystic fibrosis and how we go about it. The first item is an AffloVest. The second item is an eRapid. Bennett wears his AffloVest at school for the first time. Cystic Fibrosis causes thick mucus to build up in the lungs. Therefore, it's imperative for those with Cystic Fibrosis to regularly participate in some type of percussion therapy. When babies are born with CF, they must be pounded on in order to help move the mucus in their lungs. The difficult part of hand percussion therapy is that it can be overwhelming to have to "beat" on your child's body multiple times a day. Your arms get tired. And as babies begin to crawl, they don't want to have to lay down and let you beat on them. When Bennett was 10 months old, he was able to get The Vest, a machine that blows up with air to move the mucus around. This is a fantastic invention, for which I am forever thankful for. It has allowed Bennett to do his percussion therapy independently while watching TV or playing the ipad. The issue that we run in to with the Hill-Rom Vest is that it has to be plugged in. And, although the Vest itself is just a bladder filled with air that vibrates with hoses connected to a machine, the machine weighs about 30 lbs and can be very bulky to move. We have had to buy living room furniture specifically to keep and hide this machine. But, not too long ago, we learned about a new company who has created a portable vest that runs on batteries. This vest, called the AffloVest, allows Bennett to do his vest without having to be plugged in to a wall. 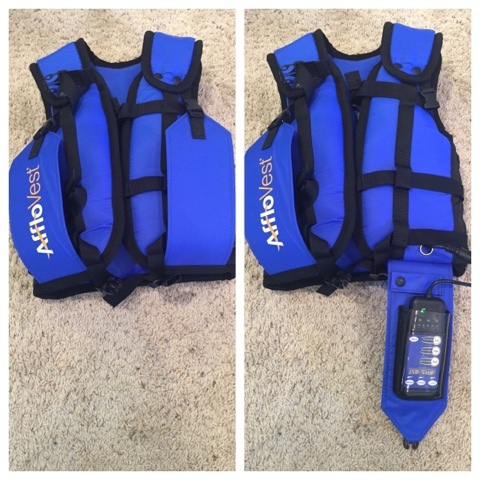 The AffloVest is smaller (about 5 lbs) and is easier to carry when traveling. This morning, a medical equipment company representative, met me at Bennett's school to demonstrate how the AffloVest works and to make sure it fit correctly. Since it was Bennett's first time on the AffloVest, we didn't pull it up very tight on him. Ultimately, once we use it for real, it will sit more snug across his chest (there shouldn't be more than 5" opening across the chest). Bennett was doing his vest in this picture but you would never know because it moves softly and is very quiet. The AffloVest works so simply that it's easy for Bennett can do himself. 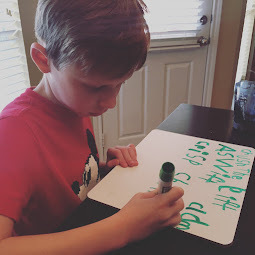 Easy for a kid to run means easy for a babysitter to learn and run as well, which is something CF moms have to think about! The first vibration (called P3) causes the upper body with a regular percussion rhythm. The second vibration (called P2) provides deep oscillation of the thoracic activity. The third vibration (called P1) activates individual zones in the vest in succession with the oscillation traveling up and down the thoracic cavity. Each vibration stage lasts about 8 minutes. So an entire percussion treatment on the Vest is 24 minutes long. The one design flaw I recognized almost before we got started was that there is no button to run all 3 of these vibrations. Therefore, the machine will go for only 8 minutes at a time. For a 6 year old, that means that even though he may be swinging outside, either he has to remember to push the next button and run the machine for the next 8 minutes (not likely going to happen if he's enjoying his play) or I have to remember and go find him and tell him to push the button. My hope is that AffloVest will soon fix this flaw so that the "standard treatment" can run automatically for 24 minutes. Here's the breakdown of the AffloVest: There are two pockets on the front of the AffloVest. The front left pocket holds battery. The battery lasts about 4-6 treatments and needs to be plugged in to recharged. One of the things I was delighted to learn is there is a car charger!! Whoo-hoo for doing treatments in the car! The front right pocket holds the attached "remote control." Both the battery and remote control are hidden in pockets that, turned up, attach to the front of the Vest. It's nice they are hidden so there are no cords to be caught when Bennett is playing while doing his vest treatment. 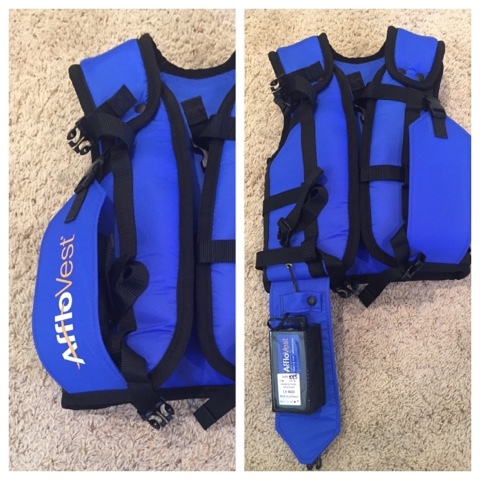 I had an opportunity to try on an AffloVest when I was at NACFC this past year (I highly recommend all CF parents do this when evaluating a vest - request to try on an adult vest - medical equipment reps are happy to provide one for adults to try). There is a natural tendency to be leary that the AffloVest might not work as well as other vests on the market since it's battery-powered and feels "weaker." Trying it on showed me that it's not really comparable to other vests because it works differently. It doesn't force air into a blatter to shake. It uses a different kind of vibration. At this point in our family, we plan to keep our Hill-Rom Vest (and the subsequent living room furniture we bought specifically to house it) and use it most of the time. 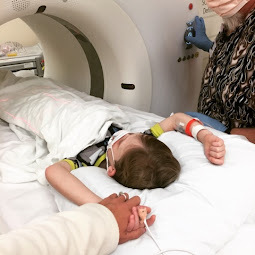 But we plan to use our AffloVest in other situations which will improve Bennett's quality of life (like when traveling on a plane, when in the car and late for school, when he's fallen asleep in his bed before we did the vest, when he's at a sleepover, etc). As Bennett grows, he will be able to articulate which vest is a better therapy for his lungs. But, until now, we're are thankful to have a new way of caring for Bennett that doesn't involve him having to be sitting on the couch for 20 minutes every day and every night. Now, Bennett can do his vest while he's in his room, while he's riding his scooter or while he's swinging in the backyard. Bennett may still have to treat his Cystic Fibrosis but now Bennett can live life even more while doing so! 1.) I have yet to see a study that says that the AffloVest doesn't work as good as the others. 2.) The AffloVest works differently, so it's a bit hard to compare (I've tried it on and feel it doesn't feel quite as violent of a shake that the Hill-Rom does. However, I think it does have the ability to do things the other Vests don't do such as vibrate separate areas of the chest). 3.) Doing a Vest treatment is better than not doing a Vest treatment so if the AffloVest provides us a way to do a treatment we would have otherwise not done one (such as when traveling or at school), then it's works better than our current vest. I think the jury is still out. Personally, I recommend it, not as a primary vest but as a supplement to what families are already doing - an option to do Vest in the car after school to and from ball practice, or when traveling overnight, or when a child wants to be active while doing his vest, etc. I'd like to hear more from CF adults what they think about it. But overall, my feeling is hand percussion is likely better than a machine and the big heavy machine Vest is probably better than the AffloVest. I appreciate that some clinicians may be hesitant to recommend things that aren't "the best." 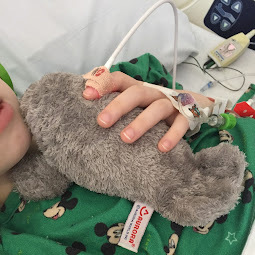 But what I consider "the best" for my son and his family takes in to account much more than just CF. Try it for 30 days. I'd recommend doing so. Try on an adult Vest. See for yourself. Great review! How nice to have a portable option. Is Afflovest cleared for "use" in airplane ? I'm not sure who exactly would clear it but I will tell you that TSA had no problem with our Afflovest. In fact, we typically have to "bomb check" our Hill-Rom Vest Machine but TSA didn't flag the Afflovest at all. So, I believe the answer would be yes, it's clear to use on the airplane. I'm not even sure how how much it costs. I would call Afflovest to ask.